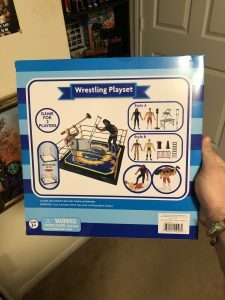 Last year for my birthday I received Wrestling Playset (Style B), you may have seen these in your locale dollar store. Mine has been sitting in my closet since I got it but tonight I pulled it out and opened it. You get two figures, four accessories like a guardrail, ladder, trash can, and construction cone. 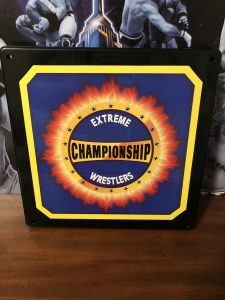 Even the ring has a center logo that says Extreme Championship Wrestlers. The turnbuckles are kinda small and ring posts have that cheap plastic, it may break if you put too much tension on it. 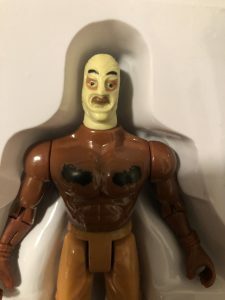 I can see this as a good alternative and at a dollar store price, I’m guessing $5 or $10 isn’t bad. 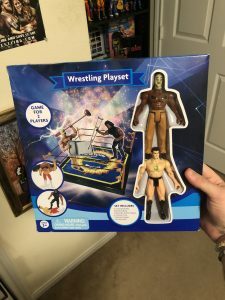 I may have to visit my dollar stores more often for these kind of wrestling playsets.